Michael McFadyen's Scuba Diving - SS Ly-ee-Moon The Ly-ee-Moon was built as a paddle steamer in 1859 by the Thames Shipbuilding Company of Blackall, London, England. She was designed by J. Ash specifically for use in the opium trade. The ship was just over 282 feet long and 27 feet wide. She displaced 1,202 tons and was powered by a coal powered steam engine which turned paddle wheels. She was also rigged with three masts and sails. At trials, the new ship attained 17 knots, an amazing speed for the time and the fastest speed ever attained to that time by a British built vessel. Not only was she the fastest steamer around, she was also lavishly furnished. It is stated that she was built for Dent and Company. It is also said she was a sistership to the Royal Yacht, Victoria and Albert. Jardine, Matheson and Co and Dent and Co were the founders of the Hong Kong and Shanghai Banking Corporation (now HSBC). Dents went bust in 1867 as a result of a huge run on banks. The Thames Shipbuilding Company went out of business in 1912. Their company football (soccer) team became West Ham United (The Hammers) now an English Premier League club who wear the works colours to this day and have the crossed hammers signifying their origins as their symbol. Later Australian newspaper reports about the ship and an item in the book The Phoenix Suburb both state that the ship was built as a blockade runner for the American Civil War. However, considering that the ship was built in 1859 this cannot be correct as the war did not start until April 1861. Unless they had ESP, how would they know there would be a war between the states? The ship's first voyage after it was launched was from Southampton on 19 July 1860 to the Far East. Her ports of call were Cape Verde Islands (6 August 1860), Ascension Island (1 September 1860), Simons Bay - South Africa (26 September 1860), Mauritius (9 November 1960), Singapore (27 November 1860) and Hong Kong (14 December 1960). On 10 February 2013 I received an email from an 80 year old fellow (who prefers to remain anonymous) who advised me that he checked the Lloyds Shipping Movements records in Guildhall library in the City of London all the way through to end of 1864 and there were no timings that would allow the Ly-ee-Moon to sail right to the eastern seaboard of America and back. The American Civil War ended in June 1865, so at the most one trip might have been possible in 1865. Therefore, the claims made that in 1860 or 1861 that the Ly-ee-Moon was used as a blockade runner during the American Civil War appears to be not correct. The story was that she ran in and out of Charleston, South Carolina and this was far more profitable (and one imagines, dangerous) than her intended trade. This story stated that at the end of the war in 1865, she moved to Hong Kong. Anyway, a fact is that one of her first owners was Messrs Jardine, Matheson and Company of Hong Kong and she was used in Chinese waters for the next 7 or 9 years. Apparently she was renamed the Tahei Maru (one report says in 1863) and was under Japanese ownership (or at least management) till 1872. In 1872 (or perhaps 1874) the ship was rammed when at anchor in Hong Kong Harbour and she sank. Refloated, the Ly-ee-Moon was repaired and sailed back to England using her sails. Here, she was fitted with new engines and converted to a screw ship. It is not clear where this occurred. Of interest is that the first Captain of the Ly-ee-Moon, Norman Hill, built a house in Upper Norwood in South London. He called it Ly-ee-Moon after the ship. It had a stained glass window showing the Ly-ee-Moon. It seems that the window was destroyed during World War II when a German bomb exploded nearby. The house was sold in 1960 for development and was pulled down. It was located on part of what is called Homelands Drive, Upper Norwood. I just found your details about the ship Lyee-ee Moon [sic] and just had to e-mail to tell you that you have answered a question which has fascinated me since boyhood. I have just had my 80th birthday and when I was a boy of 11 years old I used to be a newspaper delivery boy in the South East London suburb of Upper Norwood delivering papers whilst German V1 pilotless flying bombs were coming over and dropping indiscriminately everywhere. One of the houses I delivered to was Lyee-ee-Moon and for a reason I won't bore you with, one Sunday morning I knocked on the door which was answered by an old man with a stick. Inside was a large hall and a curving staircase ,the walls of which were covered with all sorts of curios. The old boy must have seen the wonder in my eyes because he said "Do you like those?" to which I replied "Yes". "Would you like to go and have a closer look at them". "Yes please" said I. After having a good look the old man asked if I found them interesting and of course I replied in the affirmative. "Pick any one you like" he said. I chose a broad bladed knife rather like a spear head but with a short handle and I still have this today. For years I have asked local historians what they thought the name of the house represented and all said ,the name of an island or of a woman. Now you have come up with the answer. 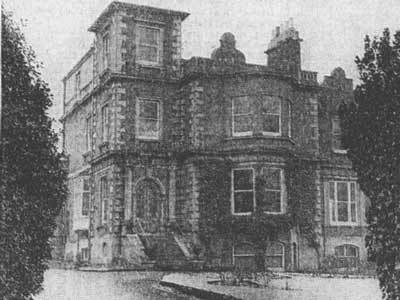 I have done some research and discovered that Norman Hill ,who had the house built retired from the sea and was living there in 1865 (the earliest record I could find). He was still there in the 1871 census age 50 listed as "Retired Master Mariner". By 1874 reference books show that an Alexander Smith was in occupancy. So Norman Hill must have made a lot of money from his contraband running to the Confederates in the American Civil War. Further checking shows several different owners of the house and they were all merchants etc. The old man I saw was named Thomas Duncan Shepherd and in 1911 census he was listed as "Colonial Merchant" so maybe the curios I saw came from the Shepherd family and not Norman Hill. My contact was in 1944 and he died 1956 still living at the house.This was sold for development in 1960 and now has about 30 upmarket houses built on the site occupied by Lyee-ee-Moon and another big house called "Homelands". The developers chose to use the "Homelands" name for the road instead of the far more interesting Lyee-ee-Moon. On the evening of Saturday 8 April 1876 the Ly-ee-Moon left Sydney bound for Brisbane, Townsville and Cooktown with 20 saloon and 108 steerage class passengers. 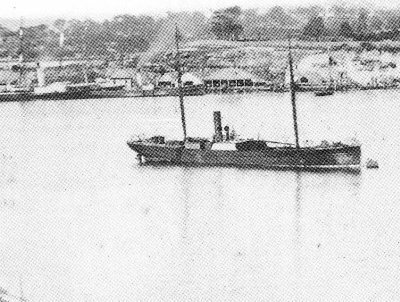 She left Brisbane on 13 April 1876. It would appear that she then went back to Sydney as on 2 May 1876 she left Sydney again for Cooktown. On the morning of Sunday 8 October 1876 the Ly-ee-Moon left Sydney bound for Brisbane, Cooktown, Somerset (this was just before the tip of Cape York but is now a ghost town) and Hong Kong. On 5 December 1876 she was about to leave Sydney for Cooktown and Hong Kong. On Saturday 31 March 1877 the Ly-ee-Moon was due to leave Sydney for Melbourne. The SS Ly-ee-Moon was sold to the Australasian Steam Navigation Company Ltd (ASNC) in 1877 or 1878 and Captain W. R. Stevens brought her out to Australia permanently. The aim was to use the newly purchased ship on the Fiji and Pacific Island runs. Just after arriving in Australia, the ship caught fire while she was being refitted in Sydney at the ASNC's premises at Pyrmont. This may have involved her being fitted with a new compound engine (built by Ouseburn Engine Works of Newcastle-Upon-Tyne in England). It is reported that she was scuttled to put the fire out. The ship was again raised and £4,000 spent repairing her. Some modifications were made, including removing a mast and making her schooner-rigged and putting the saloon on the main deck. In 1878 the Ly-ee-Moon returned to service and ran on the Sydney to Melbourne run. The refitted ship was quite popular and held in high esteem by all who travelled on her. On Wednesday 19 September 1883 the Ly-ee-Moon left Brisbane for Sydney and Melbourne. 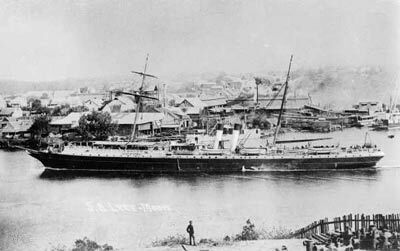 On Saturday 29 May 1886 at about noon, the SS Ly-ee-Moon left Melbourne bound for Sydney. Aboard were 55 passengers as well as 41 crew. Captain Webber was the skipper. The cargo of the ship included hats, benzine, tobacco, stationery, pepper, oatmeal, vegetables, potatoes, bran, tea, soap, chaff, hap, guano (bird crap! ), wine, flour and 250 cases of whisky. At about 7.45 pm on 30 May 1886, Captain Webber left the ship in charge of the Third Officer, J. Fotheringhame (note this is the correct spelling as advised to me by the great-granddaughter of Mr Fotheringhame, Sue Strachan - see references). The ship was approaching Gabo Island (just south of the New South Wales/Victoria border) and the lighthouse there had been sighted. He instructed Fotheringhame of the course to steer and told him to call him when the ship was nearing Green Cape. Green Cape is just north of the border and about 26 kilometres south of Eden. In 1883 a 29 metre high lighthouse was constructed at Green Cape. The light was 44 metres above sea level and the light could be seen 18 kilometres away. Sue Strachan has told me that her family's oral history of the sinking records that Captain Webber was drunk in his cabin and that Mr Fotheringhame attempted many times to get him to come to the bridge before he actually did come up. In any case, at about 9 pm the Captain returned to the bridge and found that the Ly-ee-Moon was heading straight for the rocks on Green Cape. As he ordered the engines to be reversed, the ship hit the rocks under the lighthouse. It was too late and within 10 minutes the ship was broken into two sections. The stern was on the outer reef (perhaps a bommie - see later) and the bow floated towards the shore. The bow section was close to shore and after a while, the foremast fell and reached the rock platform. Three seamen and the boatswain crawled along the mast to safety. They joined the lighthouse keepers and attempted to rescue the remaining crew and passengers. An attempt was made to fire a light line from the shore to the bow section but this failed. A fishing line was thrown to the ship and a rope was tied to it and hauled to shore. A passenger, Herbert Lumsdaine, went hand over hand along the rope and made it to the shore. Fotheringhame and Alfred Smith (an employee of ASNC) tried to carry another line ashore but failed. However, Fotheringhame's family's oral history records that he did make it ashore with a line. He apparently kept a penknife that he cut the line with and eventually gave it to his grandson. According to newspaper reports of the time, the Chief Steward, W. Thomson, was successful in taking a line ashore and the remaining 11 people alive on the bow section made it ashore, including the Captain who was the last one to leave the wreck. The lighthouse keepers assisted in the rescue. 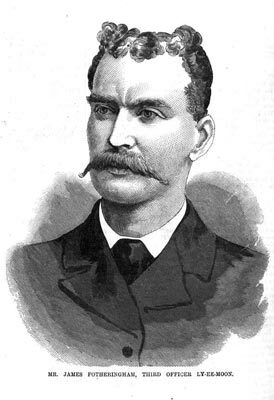 Daniel Whelan, the Second Lighthouse Keeper, was recommended for an award from the Royal Humane Society for saving six persons. Ola Thorpe, boatswain, and George Walters, telegraph operator at the lighthouse, were also recommended for an award for saving two persons. Andrew Bergland (a passenger) and James Fotheringhame were recommended for an award as well for attempting to save a lady. Mr Fotheringhame was awarded a Gold Medal by the Society and it is now with his descendants on his son Ralph's side of the family. It was now about 3 or 4 am. There were about 20 people on the stern section and they could be heard during the night but by morning, they were all dead and the stern washed into the sea. The news reached Sydney the next day and the Premier of New South Wales, Sir Patrick Jennings, dispatched the pilot vessel Captain Cook I to Green Cape. She arrived there at 5.15 pm on 1 June 1886. The steamer SS Bega was also ordered to assist and she departed Eden for Green Cape at daylight on 1 June 1886. She left Green Cape at 9.30 am the same day and then departed for Sydney from Eden and 10.30 am. An Inquest was held on 1 and 2 June 1886 at Eden before the Coroner, Mr Magnus, JP, of Eden. The jury delivered its verdict at 8.30 pm on 2 June 1886. It said in part that "gross neglect has been shown, but there has not been sufficient evidence before us to point to the guilty person or persons". 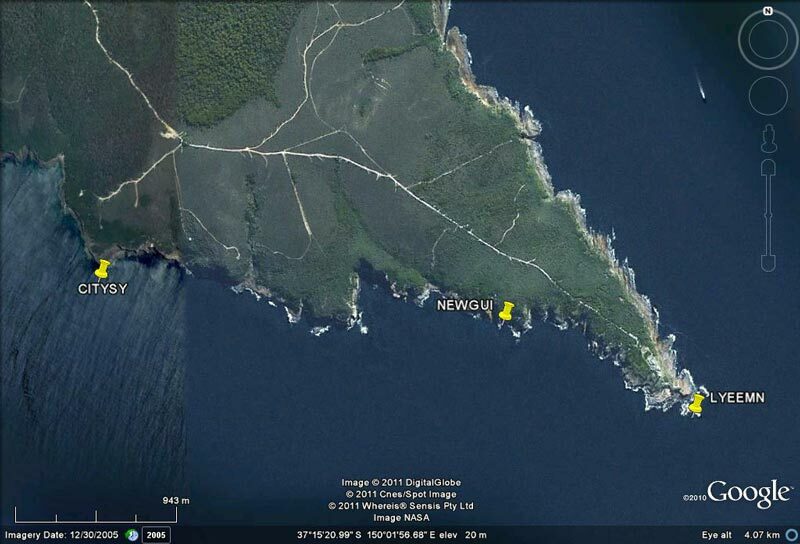 The Captain Cook stayed in the Green Cape area searching for bodies. 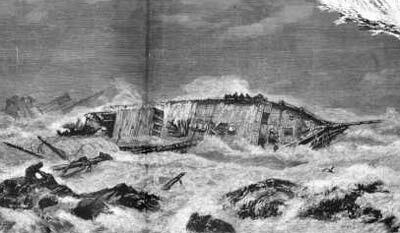 On Wednesday 3 June 1886 the ship was reported to be totally broken up and bodies were seen floating off the point. The next day the Captain Cook collected several bodies, including one of an elderly lady. This was Mrs Flora Hannah MacKillop of St Kilda, Melbourne. Mrs MacKillop was an "elderly lady, mother of the Mother Superior of St Joseph's Provident Institution". The Mother Superior was Mother Mary MacKillop, the person most likely to be canonised by the Catholic Church as Australia's first Saint. Mrs MacKillop, one of the Saloon passengers, was on her way to Sydney to see her two daughters, Mary and another who was also a nun. Mrs MacKillop's body was identified by her nephew, Mr Macdonald. Mrs MacKillop's funeral was held on 7 June 1886 at St Michael's Church, Lower Fort Street, The Rocks (Sydney). The Reverend Father Murphy, SM, conducted the mass and the church was said to be filled to overflowing. Mother MacKillop attended of course as did many of her nuns. 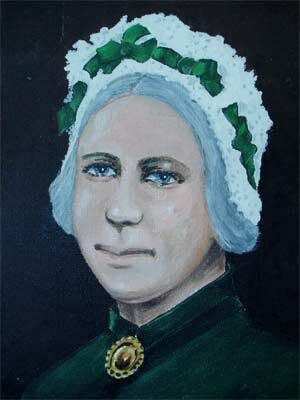 Mrs MacKillop was buried at St Charles Cemetery at Ryde but later the body was moved to the North Ryde Cemetery where it now rests. 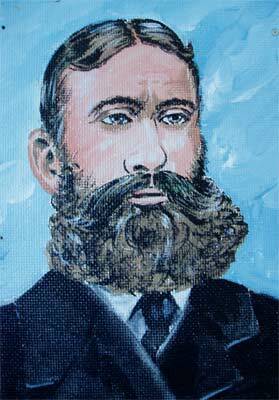 Another to die was Mr K. McGregor, also a Saloon passenger. He was said to be a promising young actor on his way to join the Howloways Dramatic Company in Brisbane. Also lost was a considerable amount of manuscripts, plays, music and equipment belonging to the company. A Mr Griffen who died on the ship apparently boarded the Ly-ee-Moon instead of his intended vessel. A total of 71 people died, 21 out of 26 saloon passengers (17 men, 6 women and 3 infants), all 19 steerage passengers and 31 of the 41 crew. The survivors (without the Captain and Third Officer) arrived in Sydney on the Captain Cook at 3 pm on 4 June 1886. Five of the bodies recovered (not including Mrs MacKillop) were buried at Green Cape at 9.30 am on 4 June 1886. The bodies of most of the dead passengers and crew that were recovered were buried at the same location (just north of the Green Cape Lighthouse and about 100 metres into the scrub off the access road). The ship was not insured. Today the wreckage of the Ly-ee-Moon is located in the gully between a bombora (probably where the stern section was caught), the reef to the west and the shore. There is also some wreckage on the rock platform (some boiler plating perhaps and parts of the rigging). This can be seen from the shore. The Ly-ee-Moon can only be dived in extremely calm seas and there are only a handful of days in a year where the right conditions are available. Due to the distance from Eden (about 26 kilometres), the charter operators do not generally dive this and the nearby wrecks. Therefore it is likely that you will need to use a private boat. If you have a smallish boat (say five metres or less), the best bet is to run out of the small coastal village of Womboyn but if it is very calm and no likelihood of a change, then you can come from Eden. Using Womboyn requires a lot of planning as the lake, river and bar are very shallow and you can only travel to the sea from the boat ramp in the period about two hours either side of high tide. Therefore you need a high tide of about 1.8 metres, occurring about 9 am to 12 am enabling you to exit the bar at 7 am to 10 am. Also, you need calm seas, no swell at all from the south and very calm from north east at the most. Arriving at Green Cape below the lighthouse, anchor between the bombora and the western reef but out a bit. GPS Reading for the anchor point is approximately 37º 15' 55"S 150º 03' 01"E (using AUS66 as datum - if you use another see my GPS Page). Swim into this gap and next to the bommie you will find the first pieces of wreck. In amongst the small boulders you will find bits of metal, mostly unidentifiable. There are also some pieces of plating jammed at the bottom of the bommie wall. A bit further on there are two bollards, some copper piping and pieces of pipe bent in strange shapes. The depth here is between 12 and 14 metres. Travelling further to the north, the depth decreases gradually and there is no wreckage. Keep going and follow the eastern wall. Here you will find more pieces of wreck in 7 to 9 metres. You will see some iron bits and then a stainless steel propeller and shaft attached to a bit of timber located under a large boulder. This is obviously not from the Ly-ee-Moon as it is too small and not of the appropriate metal. It is probably from a fishing vessel. Behind the boulder there are some much more interesting items. One of these is a diesel engine, also not from the Ly-ee-Moon and most likely from the same fishing vessel. It is covered in a great deal of growth and appears many years old. Adjacent to the engine is an anchor that appears to be from the Ly-ee-Moon and part of the cylinders from the steam engine. There is not much else here, perhaps some boiler bits. I had a look in the shallows at five metres but it was far too surgy and totally covered in dense kelp. As mentioned above, up on the rock platform there are more bits of the wreck, mainly some plating and girders. There also appears to be some sections of a boiler and fittings from the mast rigging. Although there does not appear to be a huge amount to see, it is nevertheless an interesting wreck well worth visiting. The only way to dive this location (unless you have your own boat) is by Merimbula Divers Lodge who can provide accommodation as well as boat services. I can really recommend their attention to all your needs. They have indicated to me that they will organise dives to the Green Cape area for groups, but it would depend heavily on weather conditons and time of year (eg outside peak periods). E-mail from Sue Strachan from Devonport, Tasmania, great-granddaughter of James Fotheringhame, 3rd Officer of Ly-ee-Moon. The Phoenix Suburb by Alan Warwick, (Blue Boar Press London, 1972), information passed onto me by Mary Mills.